Except for when the date changed from 1999 to 2000, I have never paid the first of January much notice. In all our years together, my husband and I have neither held nor attended any parties on December 31. We prefer to open a bottle of champagne here at home alone. We reread the Christmas cards and look back over the year that’s passing, to the births and deaths, the weddings and funerals, the events in our private life together. We lift a glass to those who have gone, we smile to think of those new babies or new friends who have entered our lives and then, on the stroke of midnight, we go out into the frosty air to ring the old iron farm bell that has stood in the same approximate spot for over a hundred years. Thirty minutes later, we’re in bed. No balloons, no confetti, no shiny hats or tin horns, and certainly no New Year’s Resolutions. And yet, there’s no denying that sense of a new beginning. A clean slate. Another chance to try to do it better. After the excesses of Christmas, it’s a relief to sit down to the traditional Southern New Year’s fare of black-eyed peas and collards or turnip greens. Whether served plain with simple corn pone or gussied up with rice and ham into Hoppin’ John, the cook always drops a dime into the bowl before bringing the peas to the table. Whoever finds the dime on his or her plate is guaranteed good fortune in the new year, but every pea eaten promises an extra coin in one’s pocket and a healthy serving of greens is supposed to ensure plenty of folding money, too. New Year’s day is also when I start a fresh record book. 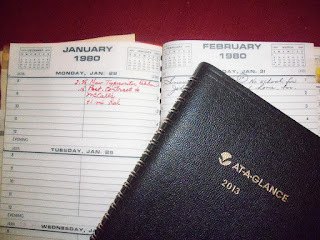 I bought my first one in 1980 to note any day-by-day expenses connected with writing. I had just sold my first novel and thought it was time to begin acting like a professional. And because there was more space for each day than was needed for mileage figures and expenditures, I got in the habit of jotting down who had come to dinner, phone conversations with other writers, accounts of talks I’d given, conferences attended, etc. etc. I stapled in concert ticket stubs, newspaper clippings when the Berlin Wall came down, election results, menus, and cartoons that joked about the writing life. 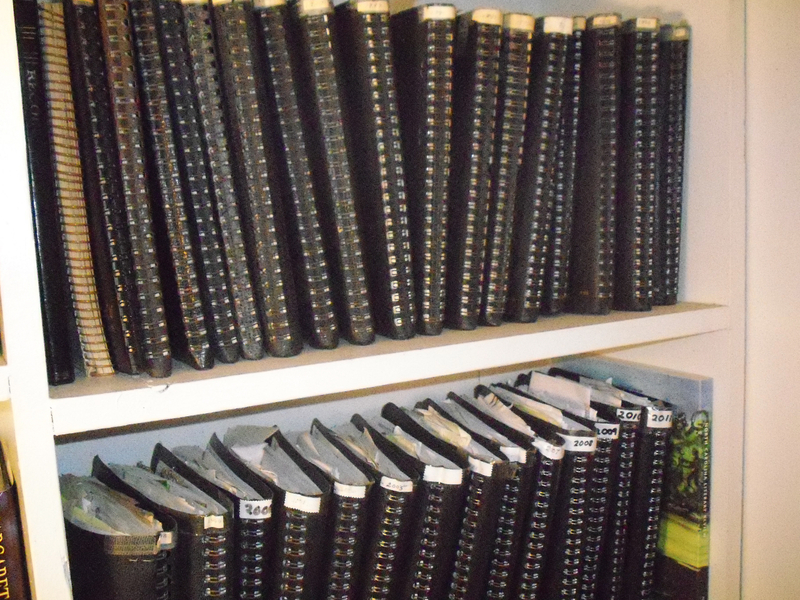 Over the years, these books have become part business ledger, part scrapbook, part diary and after 30 years, they are a memory crutch as well. 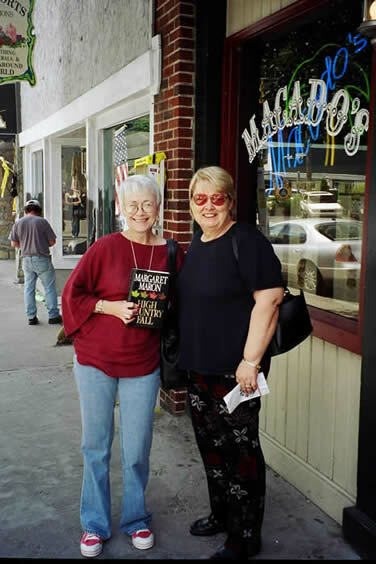 When I can’t recall my first Bouchercon or when it was that I signed at Kate Mattes’ store or even how I first met Kaye, the journals not only pinpoint the dates but remind me who else was there, or where we went to dinner. Hello and Welcome, my friend! What a lovely tradition you and your dear Joe have for ringing in the New Year. I love that. I also love the idea of all your journals - how perfect! Kinda neat sitting here thinking my name may have popped in a few times over the past several years. 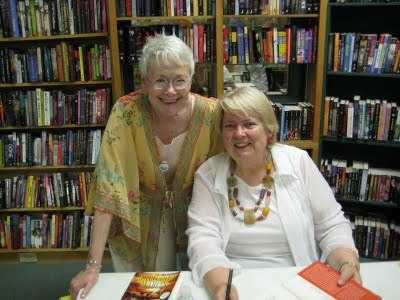 Thanks for being here, Margaret, and for helping me ring in another new year here at Meanderings and Muses. Hi, there, Margaret! What a great idea, to keep all your memories in one place in a journal. Wish I'd thought of that, lo, these many years ago. On the other hand, I've kept appointment calendars every year, which kind of serve a minimalist version of the same thing. Happy New Year's! I hope to meet both you and Kaye this year, in person. Ringing the bell on 2013, and wishing you both the very best. Thanks, also, to both of you for excellent entertainment. Love the idea of the iron bell, you must feel a marvelous sense of history as you ring that bell. As for your notebooks, some library somewhere will love to have that collection in their archives. Nothing like a local author giving everyone a glimpse into the life they led while writing so many things that were loved by so many. Enough to make any archivist drool. Oh, what a terrific idea! ANd Karen in Ohio, I do the same thing.. I think it's lovely and reassuring that we WANT to remember, you know? Hi Kaye. Hi Margaret. I've meandered over here to say hello to two of my favorite muses. Kaye, you never disappoint in lifting my spirits. Today you did it by having Margaret over for a chat about my favorite writing mode, journaling. Margaret, I love that you use your records and expenses book as an accounting of events and memories, as well. Happy New Year. By chance, the last book I read in 2012 was FUGITIVE COLORS -Sigrid Harald #8. I was sad to finish. I was just discussing with another reader if I would like your other series. She said "yes". I started keeping a journal in 1980 also. I was given a book like calendar with all the days of the week on one page and then a picture on the facing page. That first one was pictures from the Metropolitan Museum. Every year they are different, sometimes Sierra Club, Wisconsin Historical Society, Maine, cats, Wisconsin poets , operas, Georgia O'Keefe ( actually had 2 of those over the years). Often we pick them up on vacation as a memento. They are stuffed full of bits and pieces. I fashioned a pocket at the back to hold theater tickets, graduation programs, newspaper clippings, my birthday cards etc. I seldom manage to write daily but try to get the important milestones and the little fun things like "1st robin of spring". Just a note re' the first book I read in2013,,,LOVED HONOR MORE...it has a character in it name of Kaye Barley!